Years ago, I was just a goofy kid living in Wilmington Delaware, getting all of my music information from MTV which, at the time, told me the Van Halen and Skid Row were about as great as music got. Well, one day I ventured to South Street, way up in Philadelphia where things were crazy and weird and mystical. And while I was there, I met some people who said "Come with us to the Trocadaro, we're going to see this band called Tubalcain." 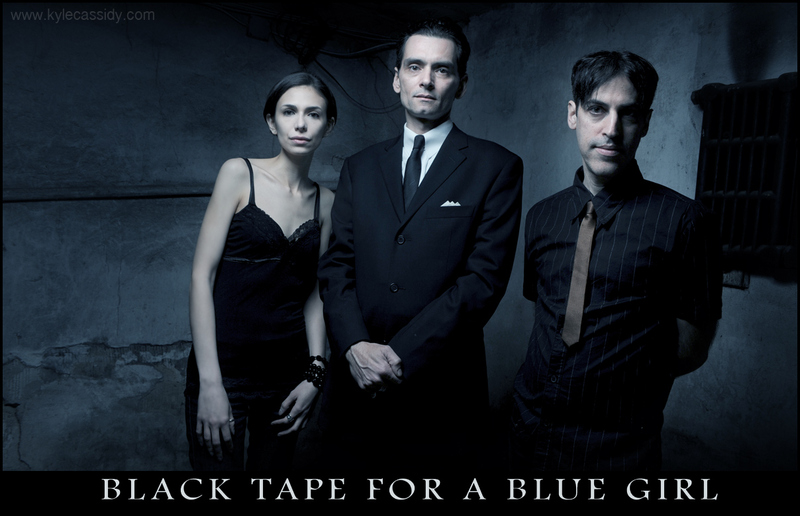 Well, Athan Maroulis from Tubalcain went on to even more glamour and success with Spahn Ranch and then somehow drifted into Black Tape for a Blue Girl who, this morning, drifted themselves into my house for a photo shoot. I shamelessly fanboi'd all over Athan who was gracious and signed all my Tubalcain and Spahn Ranch CD's. And then he spent an hour talking to trillian_stars about Victrolas and Frank Sinatra. You may also note that my pal Nicki Jaine is in Black Tape. And those of you who have been reading for a while will remember that it was because I sent Nicki Jaine a fan letter years and years ago that I ended up working with Neil Gaiman. What do I walk away with from all this? In retrospect I realize that it's nice to send people fan letters, and that every step you take should be motion towards -- it might not make sense now but people who are doing thing attract other people who are doing things. It's the gravity of art. Eventually your idols collect in your living room. And this is why we started 2xcreative. yeah, that needs to be a tattoo on everybody's forearm, doesn't it? then you'd only be able to read it when you were in the bathroom, and it would be backwards. but all your friends and even strangers would be constantly reading it out loud to you. Is she officially with them now? SQUEE! buy the record, there's a beautiful booklet in it with lovely photos of her (that i didn't take). and brian viglione too. Very very very true words. sweet barking cheese -- chad michael ward people, right here in my lj! check him out if you don't know him. He's an awesome photographer. We have Coilhouse now & gothic beauty. Back then I think that was the only game in town. I found some of my favorite music in Propaganda. I loved it for turning me on to Elias Mehringe's movie "Begotten". Got really sad when they slowly faded away. I like this post as it's timing is needed for me today. I am curious; has Athan ever said where the first band's name is from? Tubalcain has a meaning to me but I am curious if has the same meaning to him or the band. it's biblical. and Very Metal (as the young ones would say). And the world gets smaller again! I knew Sam when he lived in Chicago-he married a friend of mine, Lisa. I've always held to "support your local musicians" and have said it too. It's amazing what one can find in one's own backyard and even more fun when they do well. Congrats to them and to you! I thought you grew up in New Jersey! Your fan mail story reminds me of some advice I was given some years back by Voltaire. My band was opening up for him at a show and we were chit chatting as we set up our respective merch tables. He had a comic book collection he had collaborated with a whole bunch of people on. I asked him how he ended up working with so many cool people. He told me, "If you don't ask, they can't say yes!" I've since used that advice on many occasions and it's always surprising when people do actually say, "yes!" "If you don't ask, they can't say yes!" fantastic photo great work!! I completely agree with you Nicki Jaine is a fantastic talented artist. You got to follow the clues. "...and that every step you take should be motion towards."